This pendant is just a centimeter high, but it packs a lot of sparkle in a small space as it hangs from an 18" box chain in elegant fashion. This petite diamond heart fills a 14K white gold frame with 11 pave diamonds that sit side by side and cover this emblem of love with little room to spare. These stones total nearly a quarter carat in weight, making this piece a lovely way to honor the love that makes your heart light up. 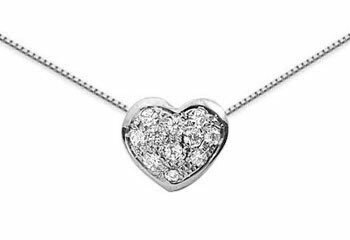 We guarantee our 0.22 Pave Diamond Heart Necklace, 14K White Gold to be high quality, authentic jewelry, as described above.